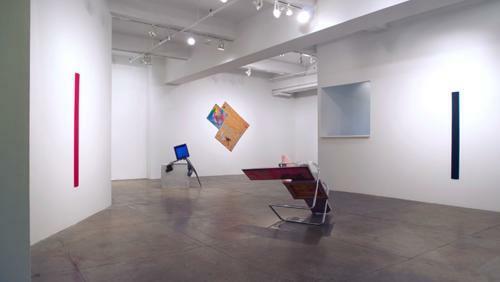 View of “Peter Alexander and Sarah Braman,” 2010. This show creates a cross-generational dialogue between two artists who are primarily concerned with space and color, and with how these aspects of sculptural work affect light on a surface. Peter Alexander was born in 1939; Sarah Braman in 1970. They are from opposite coasts and different generations, but a connection is visible in the richness of the relationship between the two artists’ practices, both of which reveal a predilection for domestic sensation. The opening gambit is from Alexander: Pink Drip (all works cited, 2010), a rectangular wall-based work made of cast polyester resin and a poured-in pink pigment that makes the upper portion a deeper hue. The pink color runs through the sculpture, which diminishes and becomes physically thinner as the color fades. It is as if a slip of paper or fabric has been hung out to dry. The uneven bottom edge casts a rough shadow that appears to flutter. Adjacent is Friend, a floor piece by Braman, and this juxtaposition develops the conversation between the two artists. Braman presents a common tubular chair (with light salmon-hued upholstery) pivoted upward on one edge of its base and held in place by a slab of thick, gray, golden-veined marble that is laid across the chair’s seat in a carefully calibrated balancing act. This physical manifestation of gravity is further emphasized by a piece of heavy plywood attached to the upper end of the marble slab. Braman employs ordinary materials yet makes them appear slightly disconcerting; her strangely transformed objects seem to express unexpected latencies and desires. In this respect, both artists plumb the depths of domesticity to construct a marvelous dialogue.